The Club shall be called the North Eastern Counties Dobermann Society (hereinafter called the Society) and its objectives shall be to foster and promote the interests, welfare and good name of the breed, bearing in mind that the Dobermann is a working dog. The Society shall not be classed as a trade or business and the profits of the Society from all sources shall be devoted to the furtherance of the objectives of the Society. The Society shall consist of an unlimited number of Members, Junior Members (under the age of 18) and Honorary Life Members, all of whose names and address shall be entered in a register kept by the Membership Secretary. Application for membership shall be made to the Committee through the Membership Secretary on official Society forms obtainable from the Membership Secretary. The form shall be completed by the applicant and submitted through the Membership Secretary together with the appropriate current subscription. Each application shall be considered by the Committee who shall have the right to refuse it without disclosing their reasons. No candidate shall enjoy any privilege of membership until this application has been accepted by the Committee except at the Inaugural Meeting. 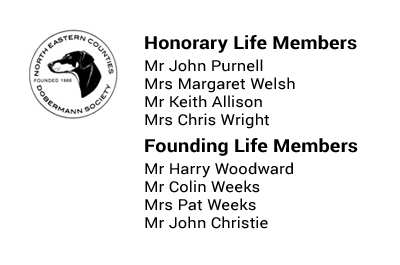 The Committee may recommend for Honorary Life Membership their or other member’s nominations, any person whom they may consider merits such distinction. Recommendations are subject to ratification at the next Annual General Meeting. Honorary Life Members will be exempt from paying the annual subscription but shall enjoy the full benefits of membership. The Committee shall consist of a President, Chairman, Honorary Secretary, Honorary Treasurer and a Committee of up to 12 members. The management of the Society shall be in the hands of the Officers and Committee all of whom shall retire annually but shall be eligible for re-election. The Society may annually elect a President, a person within the Dobermann breed or from outside it and the Office shall be non-voting. The Chairman shall be elected annually from the floor. There shall be a Committee of up to 12 elected members and an Honorary Secretary and Treasurer, both of whom shall be ex-officio members of the Committee all with voting rights. The Committee shall each year at the first meeting following the Annual General Meeting elect from among its members a Vice Chairman, Membership Secretary and Show Manager. Committee Meetings shall be held as often as deemed necessary by the Chairman or Secretary, or by the majority of the Committee. For the transaction of business at the Committee meeting a quorum shall be 50%, of whom at least 5 shall be elected Committee members. Except in an emergency, at least 21 clear days notice of a meeting shall be given to all Committee members stating the place, date and time. An Officer or Committee member who is unable to attend 3 consecutive meetings, other than on the grounds of ill-health, will automatically forfeit their place on the Committee until the next Annual General Meeting where they may stand again for re-election. An officer of the Society will not be permitted to handle dogs at Championship Shows organised by the Society. An Officer or Committee member of the Society, who resigns from the Committee for any reason other than ill-health, will not be permitted to stand for re-election to the Committee for a period of two calendar years following their resignation. The Committee shall have the power to call meetings to arbitrate in matters of dispute within the Society, to deal at its absolute discretion with the funds and property of the Society and to settle any question or matter not at present provided for in these rules. Any decision taken under this rule shall remain operative until the following Annual General Meeting. The Committee shall have the power to co-opt members onto the Committee in the event of a position becoming vacant between Annual General Meetings. Co-opted members shall only hold office until the next Annual General Meeting of the Society at which the election of Officers and Committee takes place. N.B. Joint Membership is any 2 members of the same family or partnership residing at the same address. New members joining the Society from 1st September in any current year, their membership will carry over to the following year. Any member whose subscription remains unpaid will not be entitled to the privileges of membership, and if the subscription is still outstanding by the last day of February of the current year their name shall be automatically erased from the Membership Register. If the Committee subsequently receives a satisfactory explanation for the delay in payment, the member may, at the discretion of the Committee and on payment of the arrears, be re-admitted to membership. At Committee Meetings and Annual General Meetings, Officers, Committee and each Society member with the exception of junior members shall have one vote each (joint members one vote each member of a partnership). In the event of a tie the Chairman, at their discretion shall have an additional casting vote. Members may not participate in any Society voting until three calendar months has expired since their application to join the Society was accepted by the Committee, except at the Inaugural Meeting. Officers and Committee members retiring under Rule 8 shall if they wish to stand for re-election notify the Secretary at least 28 days prior to the date of the next Annual General Meeting. New nominations for the Committee must be proposed and seconded by a fully paid up member of the Society on an appropriate form which must be forwarded to the Secretary at least 28 clear days prior to the date of the next Annual General Meeting. Only fully paid up members may be elected to any Office or the Committee. Members shall not be permitted to stand for election to any Society Office or to nominate another member until six calendar months has expired since their application to join the Society was accepted by the Committee. In the event of insufficient nominations to the Committee having been received, additional nominations correctly proposed and seconded may be taken from the floor at the Annual General Meeting and elected by a simple majority vote. Any member who shall be suspended under Kennel Club Rule A42 (8) and/or any members whose dog(s) is/are disqualified under Kennel Club Rule A42 (8) shall ipso facto cease to be a member of the Society for the duration of the suspension and/or disqualification. If in the opinion of the Committee the conduct of a member is deemed not to be in the best interests of the Society or is in direct contravention of these Rules or Standards of Membership of the Society, the Committee may contravene a Special General Meeting to discuss and consider the conduct of the member and whether they should be expelled from the Society. A notice outlining the purpose of the SGM will be sent to the member notifying them of the time, date, location and grounds for convening the meeting and inviting them to attend to provide the membership with an explanation of their conduct. If in the opinion of two thirds of the members present and following a vote, the members conduct was proven to be as outlined, the members name shall be deleted from the membership records and they will cease to be a member of the Society. The expelled member may within two months of the date of the SGM appeal to the Kennel Club in writing against the decision of the Society and any findings of the Kennel Club will be considered at the next Committee meeting of the Society following the outcome of the appeal. The Committee of the Society will have the final decision. A Special General Meeting will be called as often as the Committee decide. The Secretary shall convene a Special General Meeting if 20 or more members submit a clearly signed application for such a meeting stating the business to be transacted. No other business other than that outlined on the agenda will be discussed at a Special General Meeting. Members will receive at least 14 days notice of a Special General Meeting stating the date, time and place. An Annual General Meeting shall be held not later than 31st March each year for the following purpose. Agree the Minutes of the previous Annual General Meeting. Receive reports from the Chairman, Secretary and Treasurer. Elect a President, Officers, Committee and Honorary Life Members. Appoint auditors, of whom there shall be two, unless one is professionally qualified when they will suffice. Discuss any items previously submitted for inclusion on the Agenda. At an Annual General Meeting only the business appearing on the published Agenda may be dealt with, except for matters of routine or those considered by the Chairman to be of sufficient urgency. At least 42 clear days notice of the date, time and place of an Annual General Meeting shall be given and all items for the Agenda must be received in writing by the Secretary at least 28 days before the date of the meeting. In the event of personal notification of the Annual General Meeting by post, members with outstanding subscriptions 60 clear days before the date of the meeting shall for the purposes of notification deemed not to be members. The Minutes of all Society meetings will be prepared by the Secretary for agreement by the Chairman. They will be circulated as required prior to the next meeting at which they will be confirmed as accurate by a vote and signed by the Chairman. Society records will be circulated as required prior to the next meeting at which they will be available for inspection by any member entitled to vote. Reasonable notice of the request must be given to the Secretary in writing. The Rules of the Society may not be altered except at an Annual General Meeting or Special General Meeting, the notice of which includes details of the proposal to alter the Rule. Alterations will not come into force until the Kennel Club has been notified and has given its approval to the alteration. The Society financial year is 1st January to 31st December in any year. A Bank account will be opened in the name of the Society to which all income shall be credited. Withdrawals will only be made by the Treasurer, Secretary or Chairman with two signatures required. Reasonable expenses incurred by the Secretary, Treasurer, Show Manager or any other member of the Society and authorised by the Committee will be reimbursed from Society funds as soon as possible. A Show Manager will be appointed by the Committee from amongst its members to organise Shows and similar events or activities and to identify suitable venues for use by the Society. The selection of venues will be decided by the Committee. A Trophy Steward will be appointed by the Committee who will be responsible for maintaining records of awards and details and signatures of the recipients. Cups and trophies donated to the Society will be the sole property of the Society and they will only be accepted as a donation on this basis. Cups or trophies will be awarded in accordance with the wishes of the donor as far as is practicable although the final decision rests with the Society. In the event of an unknown donor or a donor being untraceable or no longer living, the Committee may after a period of 6 months make any change considered to be in the best interest of the Society. Cups, Trophies and Special Awards unless specifically stated will only be available to fully paid up members. Judges at all Society Shows will be invited by the Committee and selected on the basis of a simple majority vote. Any fully paid up member may submit in writing to the Secretary a nomination for a Judge and it will be considered by the Committee. Anyone invited to Judge at the Society’s Open or Championship Shows must conform to the relevant Judging Criteria for the type of Show. Applications for the A3, B or C Judging Lists shall be submitted to the Secretary in writing in accordance with the current UKDP criteria and procedure for consideration by the Committee. If approved the application will be forwarded to the UKDP by the Secretary for final approval. Applicants must meet the required UKDP criteria at the time of application. Nominations for Officers or Committee members to Judge at Open or Championship Shows organised by the Society are permitted provided they fulfil the current UKDP criteria. In the event of the Society ceasing to exist, the donors of Cups and Trophies shall be informed (subject to Rule 15) and each Cup or Trophy will be disposed of in accordance with their wishes. A Committee Meeting will be arranged to decide on the disposal of any assets remaining after all the Society liabilities have been discharged. The Kennel Club will be notified as soon as a decision is made to dissolve the Society and within 6 months of such a date the Kennel Club will be supplied with a final statement of accounts and a record indicating the disposal of all Society property. The Society is a member of the United Kingdom Dobermann Partnership. A Maintenance fee for the Society’s continued Registration will be forwarded to the Kennel Club in January each year by the Secretary. In addition to this all other returns as stipulated in the Kennel Club Regulations will be forwarded to the Kennel Club by 31st July each year by the Secretary. The Society will also inform the Kennel Club of a change in Secretary. The Kennel Club is the final authority for interpreting the Rules and Constitution of the Society, and in all cases relating to Canine and Society matters. The Society will have a list of members and their addresses available for inspection if requested by members of the Society or Kennel Club. In cases where a decision or action is required by the Committee without calling a meeting, the Officers are to act in accordance with the best interests of the Society. The Officers shall have the authority to deal with any matters or questions relating to the management of the Society not provided for in these Rules and communication may be by phone, letter, and email or in person. While the Committee makes every effort to ensure that information on this site in relation to the Society and its activities is accurate and up-to-date it does not accept any legal responsibility for any omissions or errors on the site. The Committee makes every effort to ensure that all information on the site is accurate and safe but cannot accept liability for any resulting injury or damage .Whilst the Committee makes every effort to vet external sites it does not endorse or accept responsibility over any external sites that may be linked to or from this site. When filling in forms on the site your details will be retained by the Society for the purposes of its records and for keeping you informed about services or activities offered by us. From time to time, we will collect and store information about you to help us improve the overall quality of online service we provide. Any personal information we hold about you, such as your name and email address will be used for the sole purpose of communicating with you and in line with your preferences.